Frangipani are easy to grow when you know how. 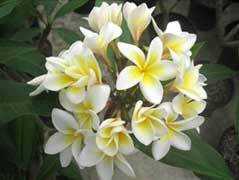 Frangipani, Timpani, Pua, and Temple Flower are amongst the common names for Plumeria. Their waxy scented flowers bring an evening tropical fragrance to the garden and outdoor living areas. This is a woody deciduous tree needing careful attention to growing. 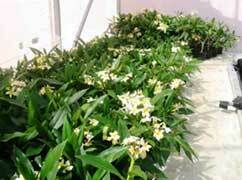 The cream and white flowering variety are the most scented and are hardy for frost-free areas. Plants are best suited for north facing walls, deck areas and poolside accompaniment. Pot culture has the added advantage of manipulating the plant to its best environment. Applications of slow-release fertilisers with a high potash ratio, such as Osmocote, seem to give good results - producing quality flowers. with applications two to three times during the growing season. The root system is always an area of caution during repotting and requires delicate handling. Frangipani need to be in free-draining soils, in warm north-facing positions relatively sheltered from frosts and strong winds. Water requirements are critical and are the secret to growing a good Frangipani. Keep Frangipani evenly watered during the growing season through the summer months. Commence watering in spring when new leaves start to emerge. Remember to dry off Frangipani as winter approaches; plants will enjoy a dry winter as they go into their deciduous mode. A little water during the winter months - once or twice a month - will keep the plant turgid. Please place Frangipani in heavy containers because they can fall over in a stand-alone situation. Pests and diseases affecting Plumeria are mites and scale insects - especially in indoor locations. These are controlled with readily available insecticides from garden centres. A quick check control for mites is to strip and burn infected leaves - the plant will grow new foliage. Also, placing the plant outside in summer months with good air movement is an ideal management practice. Large specimens can be planted outside in frost-free locations. Planting preparations need to be adhered to - with particular attention to good sharp drainage for the root system to establish.